A 64-year-old black man with prior right inguinal hernia repair two years ago presented to the emergency department with nonradiating intermittent cramping lower abdominal pain. The patient reported no nausea, had no fever, and had a normal white cell count. Examination revealed suprapubic and right inguinal tenderness with a prominent partially reducible right inguinal hernia in an upright position. Within one month, the patient had several emergency visits with similar complaints, with increasing intermittent pain, diarrhea, right scrotal pain, and a mildly elevated white blood cell count of 8,000 k/cmm. 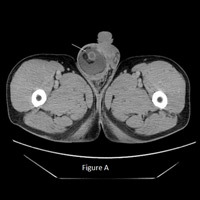 CT of abdomen/pelvis with oral and IV contrast revealed a large recurrent indirect right inguinal hernia containing a portion of the terminal ileum, entire cecum, and a sausage-shaped, fluid-filled–enhancing, thick-walled, blind-ending tubular structure about 1 cm in diameter consistent with an acutely inflamed vermiform appendix (Figure A). 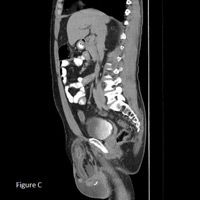 Inflamed appendix delineated on coronal and sagittal reformats (Figures B and C) with an accompanying moderate amount of reactive right hydrocele. There was no evidence of bowel obstruction or dilatation. Amyand’s hernia, or acute appendicitis within an inguinal hernia, was established. The diagnosis was confirmed during laproscopic appendectomy with subsequent open hernioplasty. Histopathology of specimen again confirmed the diagnosis. • Amyand’s hernia is a noninflamed appendix within an inguinal hernia, a rare condition usually incidentally discovered in 1% of elective inguinal hernia repairs. Claudius Amyand, an 18th-century English surgeon, was the first to describe a case of acute appendicitis in a hernial sac in an 11-year-old child. • Complicated cases with acute appendicitis are exceedingly rare, with an incidence varying between 0.13%, as reported by Ryan in 1937, and 1%, as reported by Carey in 1967. Clinical presentation is similar to a strangulated inguinal hernia. • Differential diagnosis includes strangulated omentocele, Richter’s hernia, inguinal adenitis and, in male patients, testicular tumor with hemorrhage, acute hydrocele, and epididymitis. • Treatment for Amyand’s hernia with appendicitis is appendectomy and primary hernia repair. This patient underwent laparoscopic appendectomy with concurrent open herniotomy due to cecal entrapment within the complex inguinal hernia sac. Laparoscopy on the third day of postop revealed excessive fibrinous exudate around the cecum requiring ileocecostomy, which was performed with excellent end results. • In conclusion, CT is an excellent modality to establish correct and early preoperative diagnosis of Aymand’s hernia, including rare possibility of acute appendicitis, particularly in patients with partially reducible or nonreducible incarcerated inguinal hernia. Multiplanar reformatted images further elucidate the anatomic relationship of hernia, its contents, and appendix to adjacent structures. VA Medical Center in Salem, Virginia. Ryan WJ. 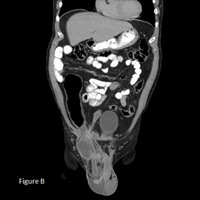 Hernia of the vermiform appendix. Ann Surg. 1937;106:135-139. Carey LL. Appendicitis occurring in hernias: a report of 10 cases. Surgery. 1967;61:236-238. Laermans S, Aerts P, De Man R. Amyand’s hernia: inguinal hernia with acute appendicitis. JBR-BTR. 2007;90(6):524-525. Kwok CM, Su CH, Kwang WK, Chiu YC. Amyand’s hernia — case report and review of the literature. Case Rep Gastroenterol. 2007;1(1):65-70. Gupta S, Sharma R, Kaushik R. Left-sided Amyand’s hernia. Singapore Med J. 2005;46(8):424-425. Yildiz F, Terzi A, Coban S, Uzunkoy A. Amyand’s hernia mimicking acute scrotum. Eur J Gen Med. 2009;6(2):116-118.